The first glimpse of a peacefully parked motorcycle prompts curiosity. While wondering about the internal specifics, an assessment of what is visible provides a hint of what to expect when it is time to crank up the engine and pursue the freedom of adventure that awaits. If the motorcycle is right out of the box, the bikes individual personality hasn’t yet developed. Gradually the bike begins to tell a tale. Hints about the psyche of the owner include the clingy stuffed animals that hold on for dear life and the gaudy accessories that scream “Look at me”. The benchmark of a bike that has reached completion is the fine painted details and finishing touches of a true craftsman. Metal engraving, fancy leather stitching and various styles of decorative paint are employed when creating the spectacular bikes that stop the crowd. 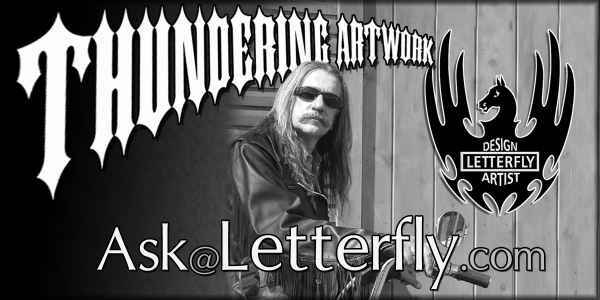 In this article the artist Letterfly will enlighten you in regards to myriad aspects of this progressive genre and provide a venue for answering the many questions he receives. While attending motorcycle gatherings across Florida and the United States as the creator of one-of-a-kind pinline designs, wet-blended pictorials, flames of all kinds and airbrushed murals and special effects. Letterfly is the resident artist at Lazydays, the RV dealership at exit 10 on I-4 and is a seminar leader and airbrush instructor. The seminar “Rolling Art,…Why a Mural?” is available for HOG groups to be entertained as the artist enlightens about the fascinating genre of custom paint. Whenever I am asked this question the first thing I must determine is what exactly the customer has in mind. There are umpteen different kinds of flames that I know of and the price is influenced by the magnitude of work that goes into whatever variety of this universal icon the artist does. The simplest flame is created with a pinline to create the classic scallop shape. The solid flame with a blended color scallop, outlined with yet another color, is perhaps the most famous. This style is sprayed rather than applied by hand with a brush. Typically the entire area is covered with masking tape and the flame shapes are hand cut and removed prior to spraying the color. The resulting effect is finished with a pinline on the edge of the flame to not only “clean it up” but to give it some visual punch. The completed pieces are buried in clear coat and buffed to achieve a flawless finish. Variations on this include, but are not limited to, the transparent color “Ghost” flame and the addition of extra spurs to give the flame a “tribal” look. The actual shape of each individual lick is created by an individual artisan and even though the design is somewhat universal, each artist has his own personal style. Another popular method of decorating with flames is by using the quickly becoming contemporary “Realistic” flame technique. These licks are airbrushed, complex and quite stunning. Like real fire some edges are crisp and others are soft. Lick shapes overlap and intertwine like what actually occurs in a bonfire. Artistically the realistic flame method is the most challenging. Every stroke requires thought. The artist studies actual photos of a fire burning and discovers that flame shapes occur in layers interacting with each other. To achieve this effect, each lick must be handled delicately so that the underlying flames will show through. “Less is more” is the rule of thumb and soon real fire is replicated with layers of subtle colors providing the stunning, show stopping design. The manner in which the price is arrived at is calculated combining both the amount of time it will take to complete the project and the cost of the materials needed for the paint job. Obviously a pinline design that is complete in an afternoon will be less expensive than a show bike paint job that will take several weeks to complete. Clear coating adds a protective durable layer of paint to your bike but requires that you dismantle the bike for the spray application to happen. Even though pinstripe designs can be created while the bike is sitting on the sidewalk at a get-together, quality clear coat only takes place in the sterile environment of a spray booth. On a positive note, although the airbrush lays down a very delicate layer of paint that without protection would wear off and disappear, the pinline design is executed with a brush and the paint is not thinned as if to spray. The brush lays down a thick coat of paint made up of more solids and the result is a durable design without clear coat. Pinline designs last for years without clear coat. If I have a particular scene or character in mind that I want the artist to replicate on my bike do I need to bring a picture? To provide an answer to this question let me tell you that although most artists have eagles, wolves and horses memorized, images such as the flag raising at Iwo Jima, Betty Boop, a Huey Helicopter and other specific icons are not usually part of their repertoire. All artists use reference pictures and most carry a library of these images with them to refer to when they receive a challenge. So if you have a favorite image you want on your bike, the answer is yes, the artist will find a reference picture very helpful.